This book tells the life story of Freeman Dyson, one of the leading cultural figures of our time. His impact on society has been huge because of his outstanding work in so many fields: as a physicist who helped found modern quantum theory; as an engineer who invented a best-selling reactor design and who planned a nuclear-powered rocketship; as a government advisor who helped shape the limited nuclear test ban treaty; as an astronomer who helped found the search for extraterrestrial life (including the concept for "Dyson spheres"); as a biologist who formulated a new theory of the origin of life; as a tireless crusader against nuclear weapons; as a book author and reviewer; and as an essayist on the thorny issue of science and religion. He has many honors, including the Fermi Award (the highest government physics award), the National Book Critics Circle Award, and the million-dollar Templeton Prize for writing on religion. Maverick Genius also tells the story of Dyson’s remarkable upbringing and his own later family life. His military work is recounted, including his time with Bomber Command during World War II and his report to the Pentagon (through the Jason organization) that helped keep tactical nuclear weapons out of Vietnam. 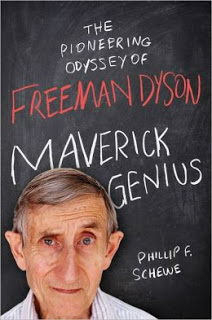 Freeman Dyson, in a New York Times book section profile, mentions the making of Maverick Genius. gave me a true picture." "A very readable story about a one of the greatest physicists who like others before him can't resist wandering from physics to the real life world of biology"
"Phillip Schewe structures Maverick Genius: The Pioneering Odyssey of Freeman Dyson around stories—in doing so, he mimics Dyson’s own use of stories to illuminate ideas. Schewe‘s writing is often stylishly vivid, giving a sense of the excitement Dyson feels for science and its myriad consequences. The sheer range of Dyson’s interests and accomplishments is striking, as is his abiding concern for humanity. The book divides his life into eras that manifest aspects of his mind: for example, Dyson as mathematician, as seminarian, as artist. That construction works well and makes the book flow. It is one of several strategies in this fine book that biographers of scientists should study." "This is a very fine book...Schewe has written a big, thorough biography of Freeman Dyson. For that he deserves our thanks." "Dyson, a British-born theoretical physicist, likes to call himself a dabbler. Yet as this first full biography, by Phillip Schewe, makes clear, his dabblings often carry the hallmarks of genius....Mr Schewe, a physicist turned popular-science writer, has garnered a wealth of material about his subject." "I just finished reading your book and enjoyed it very much. I have known many that you mention, so that added to my pleasure. I am impressed with the scholarship that you have put in. The list of folks you have talked with is truly comprehensive."